…and it involves heroin. No, wait. I meant books. Not heroin. I work in a public library, which means I have access to a larger number of books than I will ever be able to read in my lifetime. When I was a kid, around 7 or 8, I briefly thought that maybe, just maybe, I might be able to read every single book in the entire world. Once I realized that I could only read one language…yeah. That died pretty quickly. Working in a library means that I can delude myself into thinking that, hey, maybe I can at least read every book in the library. Okay, I don’t really think that. But I do have a problem (and herein lies the crux of this blog post) and that problem is that not only do I place requests for and bring home entirely too many books from the library (my library’s limit is 50 books per library card), but I check out craft books (mostly crochet) and never make a single project out of any of them! Although I am exaggerating just a bit (I’ve made a few things! ), it’s true that I check out tons of craft books only to stare longingly at the perfectly lit photos of finished items. And all that is to say that I would like to share with you a list of some of my current favorites in the world of crafting books. 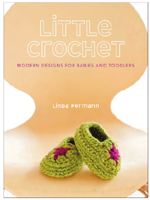 This is a cute book that features cute pictures of cute kids wearing cute crocheted clothing. I’m telling you. It’s cute. My favorite pattern is for the hooded cape. What the heck?! I always wanted a hooded cape when I was a kid! And now I can make myself an inappropriately small cape. In all honesty, there are so many great patterns that are fantastic in their simplicity. I love it. Classy lady, classy title. It puts me in mind of ladies of the night, standing on street corners, hawking their wares in shimmery sequined tops, fishnets, and pumps a half size too big, all while attempting to finish a few apple-shaped pot holders for their kid’s holiday gift exchange at school. I have completed a number of patterns from this book and they were each pretty darn awesome. I’ve crocheted a handful of the flower-edged scarves in various types of yarn. They’re a fantastic, semi-last minute gifts (if you have a few hours, that is). Come on. It is food. That is crocheted. You can’t eat it. But I don’t really care about that. Because it is food. That is crocheted. This is really one of those that I look at and think (or even say out loud to a friend who later asks me if I ever did it), “Hahahahaha. That’s so awesome! I’m going to make that!” and then I don’t ever make. I did, however, crochet the chocolate chip cookie (okay, easiest pattern in the book, probably, but it’s a CHOCOLATE CHIP COOKIE). The cookie is now a cat toy, but I can promise that my cats appreciate Rose Langlitz’s pattern. Maybe someday I will crochet a few more items in each of these books, but for now I will simply stare and drool. It’s not too many books until they find your lifeless body crushed beneath a toppled stack and your face eaten off by a cat. I love a confession followed by a review! I do have a lot of books, but at this point, I think having my face eaten off by a cat is probably more likely.